Far too many people neglect the importance of warming up before exercise. Everyone knows that they need to do it, but somehow it is skipped more often than leg day. To make matters worse, there are a lot of ineffective warm-up strategies out there that can do more harm than good. What if I told you that you that in 5 minutes, you can perform a simple warm-up that will improve your fitness and minimize your risk of injury? In today’s post, we are going to cover the best way to warm up before working out. Welcome to the fourth installment of the WCT Time Hack Series- where we teach you practical strategies that you can implement into your busy schedule to save time and increase your fitness. In Part 2, Healthy Meal Prep Basics: A Step By Step Guide For Busy Individuals, we break down the strategies we use to always have healthy meals on the go. 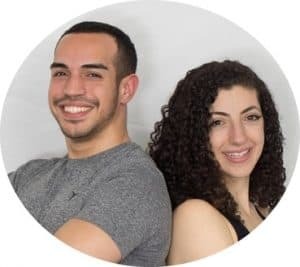 In Part 3, 9 Effective Workout Hacks to Shorten Your Workout and Spend Less Time in the Gym, we go over simple and practical methods to get the most out of a quick workout. Have you ever pulled a muscle or injured one of your joints? If you’re like most people, you would probably agree that being in pain is highly undesirable. Depending on the location and the severity of the injury, it could affect just about everything you do. Injuries aren’t exclusive to highly active individuals either. I’m sure you know a couch potato or two who have had their fair share of aches and pains. Fortunately, there is one thing that you can do to keep your body moving fluidly and decrease your risk of injury. You should perform a dedicated purposeful warm-up before working out. Warming up before exercise is critical because it will prime your body to engage in the workout effectively and safely. How many times have you seen someone arrive at the gym and begin lifting heavy weights within seconds of stepping through the door? Your body is not adequately prepared to recruit muscle fibers at high levels of intensity at such short notice. It should go without saying that exercising without warming up will increase your risk of injury. At the WCT, we believe that you can fit an entire workout in 35 minutes, including a warm-up routine. The warm-up should take no longer than 5 minutes and it should be tailored to the movements you will be performing that day. You can turn it into a total body warm-up, or a body-specific warm up. Most people think of a warm up as a 5-minute jog on the treadmill. Sure, this will get your basal body temperature up and increase your circulation, but this pales in comparison to what a warm-up should be. There are three types of warm-up exercises that every pre-workout warm-up should contain. General activation drills serve to ‘turn on’ important muscle groups that need to be awake during any physical activity. If you are like most people, the two most important muscles groups that need activation are the glutes and the abdominal muscles. We live in a society that promotes sitting and as a result, these two muscle groups lay dormant for several hours every single day. Why Do The Glutes and Abs Need To Be Activated? The glutes and the abs are a critical component of the core and should be targeted first to begin most workouts. This is because they are required to perform just about any functional exercise you can think of. If you attempt to perform compound exercises without engaging your core, you will end up in suboptimal positions which increases your risk of injury. When performing these drills, squeeze your glutes and brace your core as hard as you possibly can for a 5 count. Your glutes and your core should be on fire after doing one or more of these drills. If you do not squeeze as hard as you can, then you are just wasting your time. Relax and repeat the drill for ~5 repetitions. Often times, one activation drill is enough, but if you don’t feel the burn, then do another. The next component of our warm-ups is the dynamic warm up exercise. Dynamic exercises are meant to stretch, or elongate any muscle fibers that are either tight or stiff. Almost everyone in the world has tightness in one or several muscle groups. It’s inevitable. Your muscles will become tight from prolonged repetitive activities. 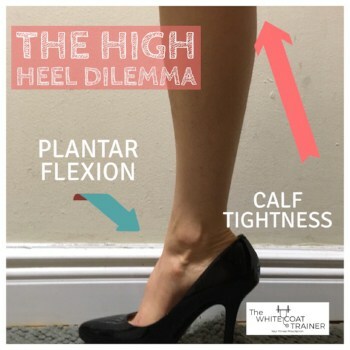 A very common example of this is tight calves in women who wear high heels often. The foot remains in a plantar-flexed position which keeps the calf muscles shortened and on tension. Over time this leads to restrictions in activities that require ankle dorsiflexion and ultimately, knee injuries. Generally, when most people hear the word ‘stretching,’ they think about static stretching. This is when you hold one fixed position for a specific length of time. Dynamic exercises provide a different type of stretch because it requires you to oscillate or move into different end ranges during the stretch. Dynamic stretches should be tailored to your particular restrictions and to the movements you will be performing that day. Here are some dynamic warm-up exercise examples along with the resistance exercise they can help (in parenthesis). Spend no more than 30 seconds in each position and oscillate into different nooks and crannies at the end range position. It is important to identify stretches that correspond to your ‘problem areas’ so that you could routinely perform these stretches throughout your regular daily life. Check out How Flexible Are You? 5 Tests To Determine If You Need To Stretch to identify any problem areas you may have. The third and final component of the warm up you should do before working out is the specific activation drill. Specific activation drills allow important muscle groups to fire that are specific to the movement(s) you are about to perform. They should be performed with minimal to no weight and for 1-2 sets of 10+ repetitions. If there is one thing that your pre-workout warmup should not include, it’s static stretching. Some studies have shown that static stretching can actually decrease a muscle’s power production before physical activity. In addition, pre-workout static stretching does nothing to address the reasons why you are warming up in the first place. It won’t increase your body temperature, it won’t activate your dormant core muscles, nor will it decrease your risk of injury. This does not mean that you should not perform static stretching. Static stretching has a bunch of benefits which we describe in When Is Stretching Necessary and When Is It A Waste of Time. The best time to static stretch is either post-workout or before bed after a warm shower. Okay, so how do we take those three warm-up components to design a 5-minute pre-workout warmup? It starts with knowing the exercises you are going to use for general activation, for dynamic stretching, and for specific activation. You must transition from your general activation drills to your dynamic stretches and immediately into your specific activation drills. It is important to do this at a quick pace so that you can increase your body temperature and your heart rate while doing these exercises. It should only take you 5 minutes to perform. If you find that the warm-up is taking you longer than 5 minutes, perform one less general activation drill. Really focus on turning on your abs and glutes throughout the rest of the warmup. This is the warm-up routine you should use prior to performing The Best Workout Template for Busy Professionals or any other physical activity. Even if you aren’t ‘working out’, performing this 5 minute warm up on any random day can help keep your body in motion while maintaining your muscles limber. What About Warm Up Sets? For example, if you are scheduled to squat 225 lbs for 8 reps today, you wouldn’t go to the gym, perform your 5-minute pre-workout warmup and then load up 225 lbs on the bar and go. It is in your best interest to perform a few warm-up sets first. People tend to fall into two extremes when doing warm-up sets. They either perform a minimal amount of warm-up sets or far too many. You should always aim to do at least 3 warm-up sets before your working weight with a progressively increasing load while decreasing the number of repetitions you do on each set. In addition, you can use the lighter warm-up sets as part of your Specific Activation drill too! We will write an entire post on warm-up sets in the future. What Kind Of Workout Should I Do Following This Warm Up? The warm-up is just the beginning. Now that you have a killer 5-minute warm up, you need to follow it up with a 30-minute exercise program. That is why we created The WCT Strength Program For Busy Professionals. It is a complete 15-week training template that focuses on all of the strategies you need to get stronger, build muscle and burn fat. There are two templates – a male and a female version. Is this the only way to warm up? Of course not. There are several strategies you can use to accomplish the same goal. Either way, it is imperative that you do it before any physical activity. Warm-ups are necessary to improve your muscles’ ability to execute at an optimal level. 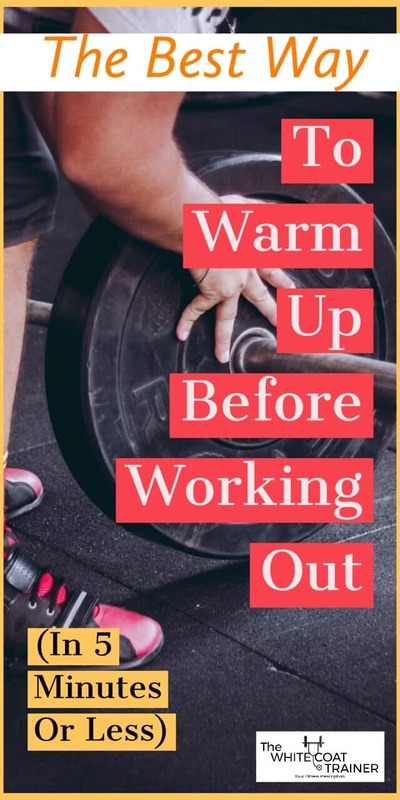 If done correctly, a warm-up will turn on the key muscles of your core before performing compound exercises, and prime your target muscles and joints for the physical activity that they are about to engage in. Do not get caught lifting weights until you have performed an appropriate warm-up. Come on, it’ll only take 5 minutes. Do you generally skip your warm-ups? How long do you spend on it? What exercises do you typically include in your warm up?